2014 begun as the year when the Spanish Blackphone was introduced as an alternative smartphone to those who are conscious of their security. Blackphone would contain a paranoid version of Android providing anonymous phone calls and protection from malicious third parties. Boeing, the guys who manufacture those large aircrafts, announced plans for a similar project back in 2012 and upon its release the device will be called the Boeing Black (H8V-BLK1). Already, the FCC has approved the Black’s design and soon enough, the dual-SIM will be in the hands of military personnel. Boeing’s device is not your normal servicable gadget, all the data and software on the device self-destructs upon taking the phone apart. 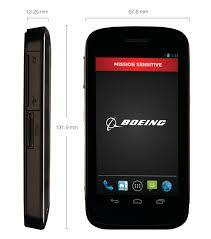 Features on the Boeing Black include GSM, WCDMA, LTE, HDMI port, PDMI port, USB , Wifi, Bluetooth and using micro SIM cards. Boeing notes that devices currently built for the regulated industries sell for between $15,000 and $20,000 a unit , upon their entry into the market Boeing should give them a run for their money. “We are going to drive down towards a lower price point, but … not mass-market price point.” – a Boeing VP during the Black’s 2012 announcement.